Jay Parini was born in 1948 in Pittston, Pennsylvania, and he was raised in Scranton. He graduated from both Lafayette College and the University of St. Andrews in Scotland, where he received a Ph.D. in 1975. He lives in Weybridge, Vermont, where he has been on the faculty at Middlebury College since 1982. He is married to Devon Jersild, a clinical psychologist and writer, and they have three sons. His books of poetry include Anthracite Country (1982), Town Life (1988), House of Days (1998), The Art of Subtraction (2005) and New and Collected Poems, 1975-2015 (2016). 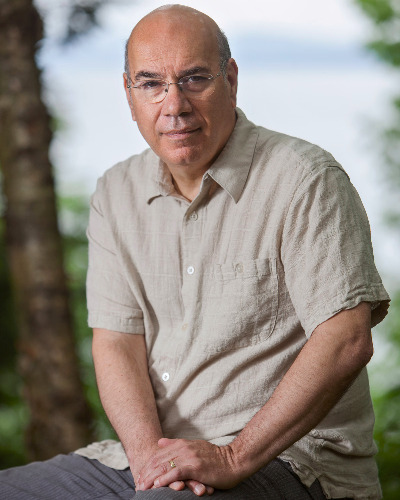 His novels include The Love Run (1980), The Patch Boys (1986), The Last Station (1990), Bay of Arrows (1992), Benjamin’s Crossing (1997), The Apprentice Lover (2002), and The Passages of H.M. (2010). He has written biographies of John Steinbeck (1994), Robert Frost (2000), William Faulkner (2004), Jesus (2013) and Gore Vidal (2015). He has also published nonfiction books on a variety of subjects, including The Art of Teaching (2005), Why Poetry Matters (2008), and Promised Land: Thirteen Books that Changed America (2008). Among his many edited volumes are The Columbia History of American Poetry (1994) and The Columbia Anthology of American Poetry (1995) as well as the Norton Book of American Autobiography (1998) and Gore Vidal: Writer Against the Grain (1997). He edited the Oxford Encyclopedia of American Literature (2004) and was General Editor of The Wadsworth Anthology of American Literature, forthcoming. In 2008 he edited The Wadsworth Anthology of Poetry. Each year, he edits volumes of criticism for Scribners in their series American Writers and British Writers. He has received honorary degrees from Lafayette College and the University of Scranton, and won various fellowships and awards, including a Guggenheim Fellowship (1993-1994) and, for his Frost biography, the Chicago Tribune-Heartland Award in 2000. He was the Fowler Hamilton Fellow at Christ Church College, Oxford University, in 1993-1994 and a Fellow of the Institute for Advanced Studies at the University of London in 2005-2006. His books have been translated in more than thirty languages, and he writes articles and reviews for many publications, including The Guardian and The Chronicle of Higher Education. He also contributes op-ed pieces to various websites, including CNN and The Daily Beast. In 2009, his novel The Last Station was turned into an Academy Award-nominated film. Film adaptations are underway for several of his other books, including Benjamin’s Crossing.